Autumn is now in full swing (Winter is near!) and before it's completely behind us, let's take a final look at a few lingering blooms and colors of this time of year. I regret not taking more pictures of the changing colors, but there seemed to be no opportunity as the rains came suddenly and kept going for a while. All the same, I managed a few parting shots, and I thought we could have a look at some interesting Fall tidbits around Chickadee Gardens. Cotyledon 'Happy Young Lady' - STILL blooming away, giving the hummingbirds a late-autumn treat. Even the end of the Echinacea is interesting to me. These thistle heads will be a feast for migrating birds in the coming days. The Salvia elegans or Pineapple sage just BLOOMS AND BLOOMS AND BLOOMS and is something like 8' tall. I'm not joking. It came from teeeeny little 4" pot some three years ago and I'm so happy it towers over everything now so the hummingbirds can find it. Rosa nutkana - Nootka rose, a Willamette Valley native. It's deciduous, has these great little hips for fall, too. I really like this one! It's in the hell strip and is doing just fine. The view of the front porch a few weeks ago - the grasses have all turned completely golden brown and the dogwood on the pot on the porch has completely lost its red leaves, but other than that, it looks about the same! The Razzleberry or Loropetalum chinense has the bronze-ish purplish leaves on the left, it's evergreen and holds up quite well for Winter interest. The end of the Red Twig Dogwood or Cornus sericea - its yellow leaves turned bright orange after this stage then fell suddenly. It's another Willamette Valley native and fabulous. I really love the way this one performs, it's gorgeous year-round and the birds love its cover and the little white berries it produces. Plus, it can be pruned back as the red bark is more intense on the newer growth so it does the plant some good. Disclaimer - this photo is from last year, but looks much the same today. If you look closely you can see the Echinacea thistles being devoured by a gang of Pine Siskins. What fun it was to watch, they cleared it off in about 15 minutes! I'm still waiting for the siskins to make their way through the garden...hopefully, I won't miss them! This really is from this Fall, but everything is evergreen so not much color change. Still...I do love the Arbutus unedo, Sword ferns (native to the Willamette Valley) as well as Oxalis oregana, also native. Good to have some green around in the dead of Old Man Winter! 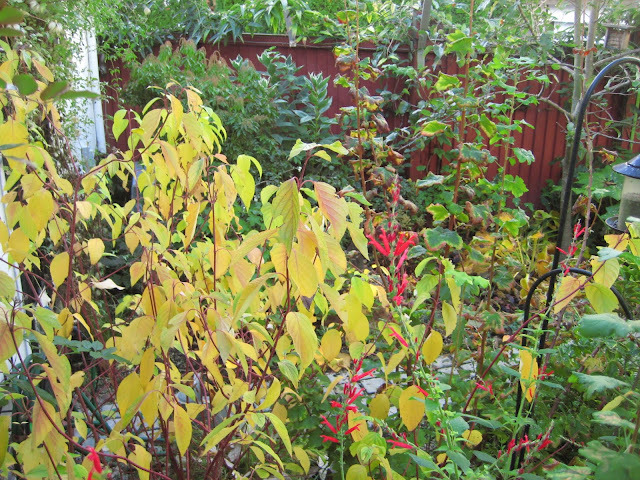 The little Vine Maple (Acer circinatum) in the pot decided to go all brown all at once. Well. The other plants on the porch are behaving at least! Still looking pretty ok so far! The last of the Echinacea in the hell strip, Spiraea douglasii or Douglas spiraea on the right, the seed heads are also faves of the birdies. More Pineapple sage with the neighbor's Japanese maple in the background. My first Agave! A very happy find at a recent plant swap. Thank you to whomever donated this to the cause, I think it must have been Danger Garden?? The last of the Dogwood color, it's all bare now...such a pretty show it put on this year. We had a gang of Cedar Waxwings come through and gobble up the little red berries earlier this fall, first time I've seen them in the garden, what a treat! In the front hell strip you can see the golden brown of the Douglas spiraea. The Crape Myrtle on the left is also bare now...it was so lovely while the color lasted. A really great Fall this year for color. Arctostaphylos x 'Sonoma' from Xera Plants. Should get 3' tall, 4 - 5' wide in as many years. He lives in the front hell strip, too...looking forward to seeing this beauty fill in. And last but not least, a lovely little find one recent afternoon just out the back door. He stayed there for a long long time and eventually flew off. We had lots of these guys visit us this summer. Love the D-flies! Yes, I'm hoping I will have some time next year to really enjoy and relax in the garden too. I bought a couple of Arctostaphylos for my hell strip too, but haven't put them in yet. Actually, I don't even have a hell strip yet, that's this winter's project. 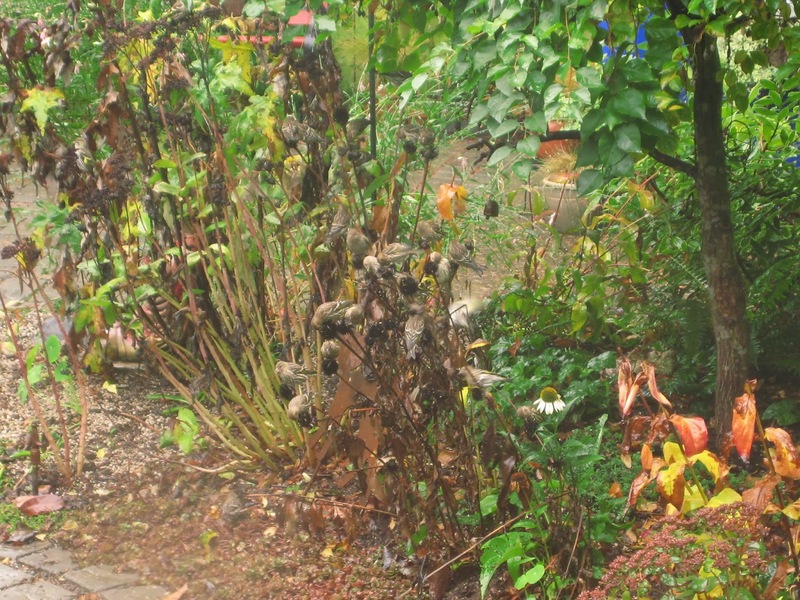 Your garden in fall is lovely! I did make out the pine siskins, they are the same color as the seedheads, but I did manage to pick them out. Hi Alison! Let us hope we both have some time to enjoy the fruits of our labors. At some point there has to be balance, right? Sounds like your winter's project is a good one, keep me posted on the Arctostaphylos....I love those guys, I have several young ones hoping they will take over eventually! Nope, your beautiful agave was not from me. I think it must have been Heather. She brought several pups from her very successful front yard agaves. Well then Heather, a HUGE thank you is in order! I love my guy! He's in the hell strip defending the not-so-dangerous plants from malicious unattended children. Looks like there is plenty there to keep those chickadees happy all winter. There sure is and if that's not enough, the feeders will be full all winter! Love those chickadees! Oh, Scott, you should have seen the orange foliage following the gold. It's such a cool plant, I'm really happy with it. And those Siskins! How cool are they? So glad you got to see them, they are a lot of fun....oh, and LOVED your video! Cheers! Although I'm no fan of winter, I wistfully enjoy the kind of autumn color you show here. And I agree with you that the evergreens are some of our most valuable plants through that long period until deciduous things begin to sprout out again. Great shot of the pine siskins feeding. I love to support the bird population too! Hullloo MulchMaid! I know, those birdies are the best! It's Birdapalooza in my backyard this time of year and I adore watching them. That's great you support the birds too, yay! Thank you ! Yes, the winter is a dreary time. I'm learning to incorporate more evergreens...it's a lesson to be sure!